Want one of the best Bumble bios, but don’t know where to start? If we could sum up all of our advice in one word, it would be BREVITY. The best Bumble bios don’t tell your whole life story — they offer a slice of your personality, invite follow up questions, and spark curiosity. The more in-depth sharing and conversation will happen in your chat and on dates! 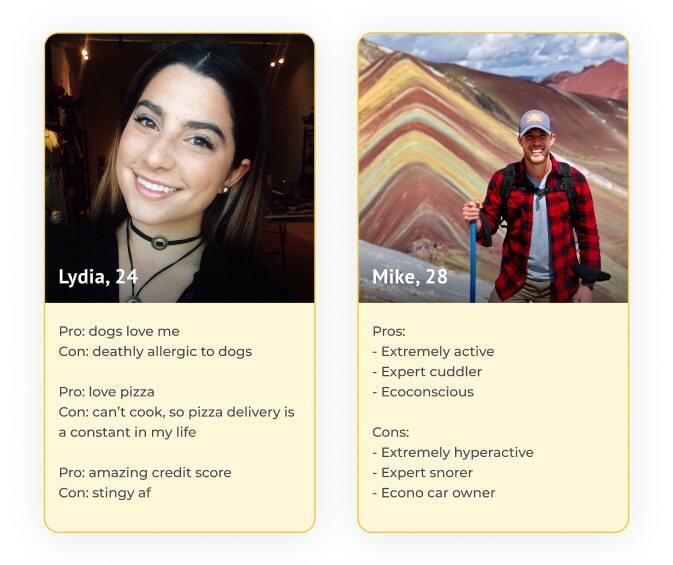 With this tip in mind, here are our examples of the best Bumble bios and Bumble profiles that are clever, funny, interesting, and good enough to really work. Let’s be honest. Before someone really knows you, they’re likely evaluating your qualities the same way you shop for a new tv. What are your perks? Drawbacks? Do you come with a rebate? 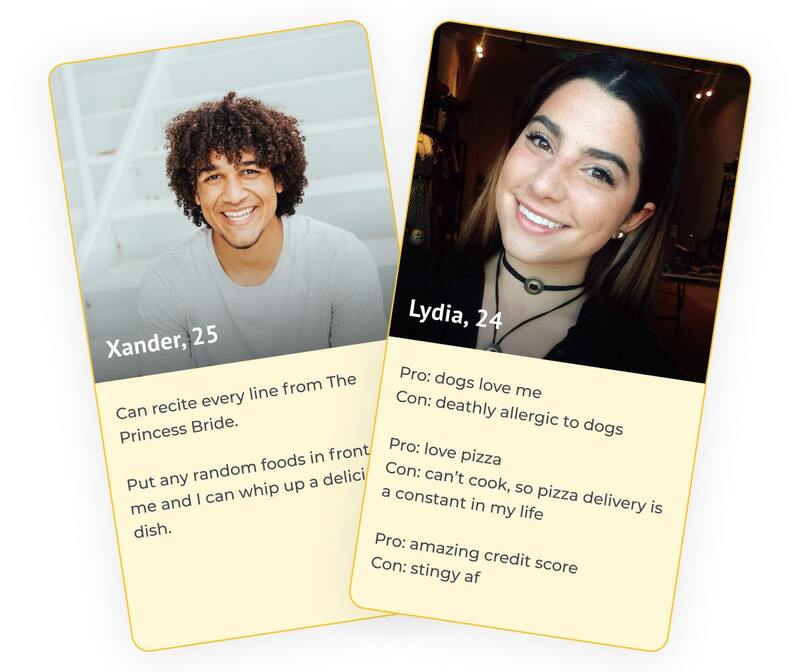 But seriously, the best Bumble bios know this and acknowledge the oddities of the dating app process without seeming bitter. A pros vs cons list can be as sincere or funny as you want. How would you market yourself as a product? Which of your “cons” are actually kinda charming? Make sure to stay light hearted and avoid too much self deprecation with your list! You don’t need to be the most funny person in the world to have one of the best funny Bumble bios that comes across as clever and intriguing. 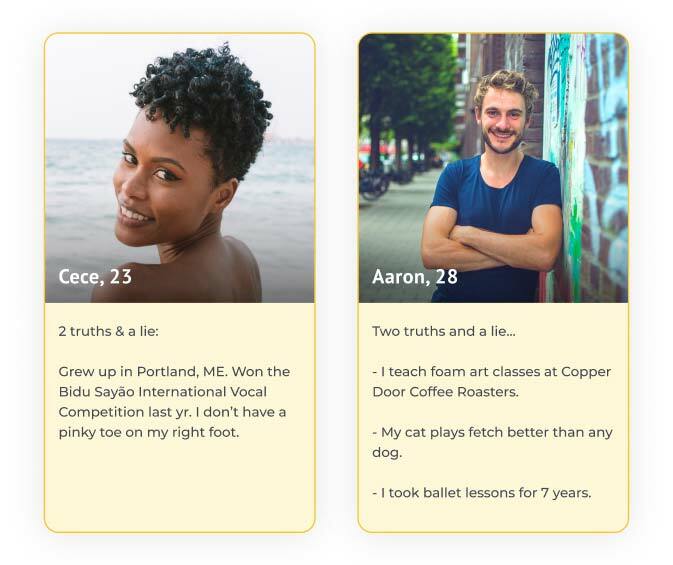 Starting a game like two truths and a lie in your Bumble bio is one “about me” idea that will absolutely compel people to match with you and find out which part is your lie! Grew up in Portland, ME. Won the Bidu Sayão International Vocal Competition last yr. I don’t have a pinky toe on my right foot. – I teach foam art classes at Copper Door Coffee Roasters. – My cat plays fetch better than any dog. – I took ballet lessons for 7 years. Are you the only person you know who hates Game of Thrones? Do you wholeheartedly believe licorice is the best candy? Some of the best Bumble bios invite a lively debate. 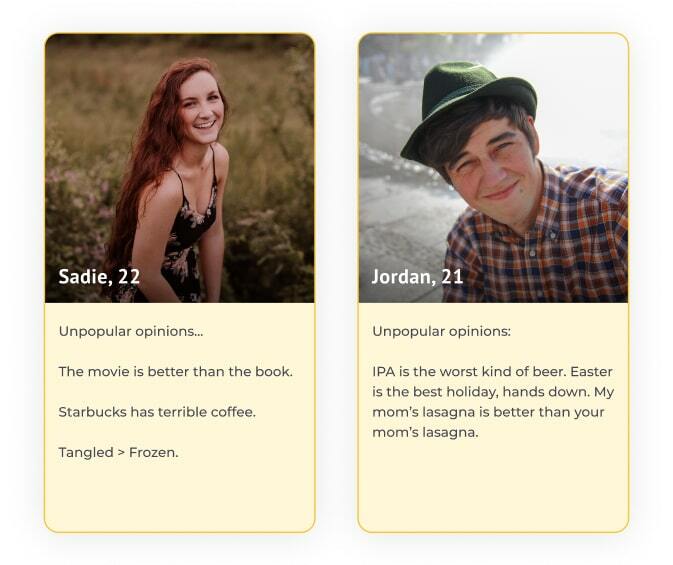 List some unpopular opinions in your Bumble bio to show you’re confident and ready to have fun chats with your matches! IPA is the worst kind of beer. Easter is the best holiday, hands down. My mom’s lasagna is better than your mom’s lasagna. What’s that random skill you can’t put on your résumé but you’re still really proud of? People love hearing about “useless” abilities, and the weirder it is, the more likely someone will start chatting with you for more details! Some of the best Bumble bios share these bizarre and silly personal talents, so they’re great as Bumble “about me” ideas. I’m really good at calligraphy…with my feet. Can and will identify brand & model of all label makers. Can recite every line from The Princess Bride. Put any random foods in front of me and I can whip up a delicious dish. If your pics don’t look good, your Bumble bio doesn’t stand a chance at getting read in the first place. 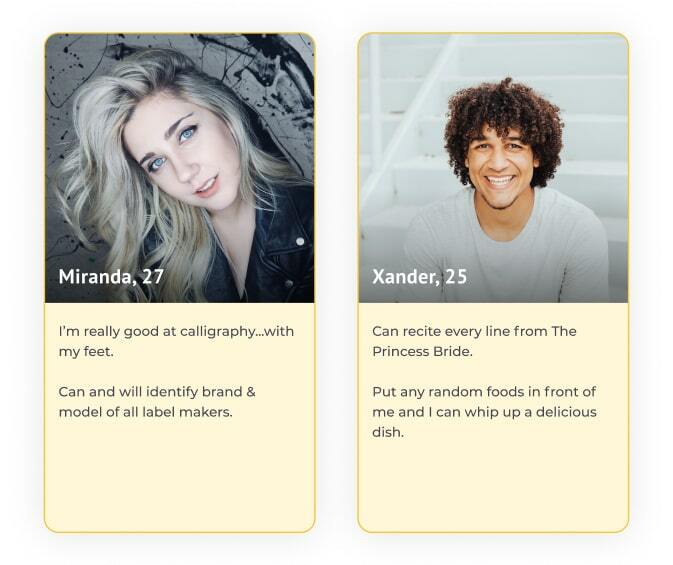 Before you start swiping, run your Bumble pics through Photofeeler to see how women or men are responding to them. 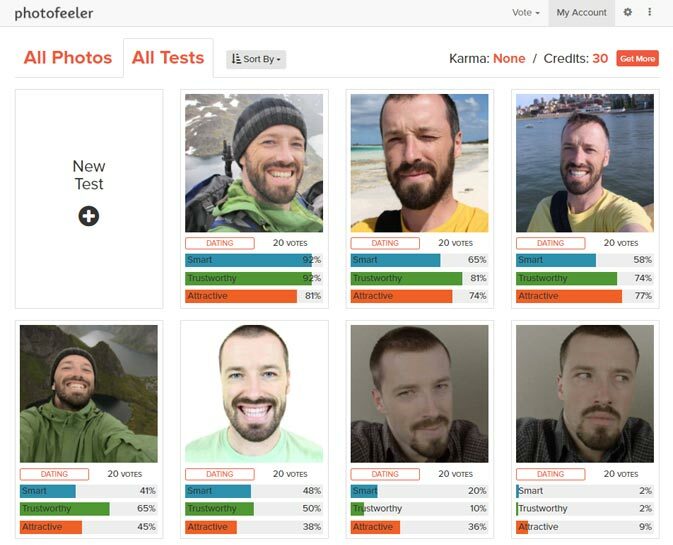 Choosing your profile pics this way has been shown to significantly increase match rates and match quality.